Climate change is arguably the most devastating and far-reaching crisis of our time. It affects everyone and everything — although not to the same degree. From oil refineries polluting communities of color to rising sea levels threatening small island nations, those least responsible for the climate crisis face the worst and most immediate consequences as a result of our dependence on the fossil fuel industry. We are pleased to see that the College has announced a new carbon charge policy and approved $300,000 in investment to reduce energy use. However, beyond the monetary commitment, the charge will struggle to achieve the administration’s objectives and meaningfully contribute to the College’s commitment to carbon neutrality by 2035. It does not do enough to cement Swarthmore’s role as a leader in the global transformation to a sustainable future and is not a replacement for divestment. While the announcement ensures increased funding for sustainability projects on campus, it will fail to make an impact on energy demand. The carbon charge only addresses demand at the College level and does not affect student demand for energy. Even departments will not be greatly impacted, as Biology head Amy Vollmer notes that her department will not notice the charge. An effective carbon charge would make energy use more expensive for students and faculty and provide them with information about their energy use. It is unclear whether the carbon charge would even affect the College’s decision making. The College should do an analysis of a planned capital investment and how investment decisions would change as a result of the charge. A $40 per ton of CO2 price is mentioned. The College’s CO2 emissions in 2015 were 4,535 tons and the carbon charge for 2016 is $300,000, which is equivalent to $66 per ton. Is the charge linked to an actual price on carbon? Additionally, the College should expand the scope of emissions that will be covered by the charge. There is no consideration of the College’s impact on methane emissions, which is a much more potent greenhouse gas than carbon dioxide. The charge also leaves out many important sources of emissions, such as food consumption and travel to and from the College by students and faculty. The charge will struggle to meaningfully contribute to the national debate on climate change policy and regulation, which is already at a sophisticated level. For instance, carbon taxes and cap-and-trade mechanisms are being implemented and set up all over the world, including by China, the European Union, a group of Western states, and Northeastern states. 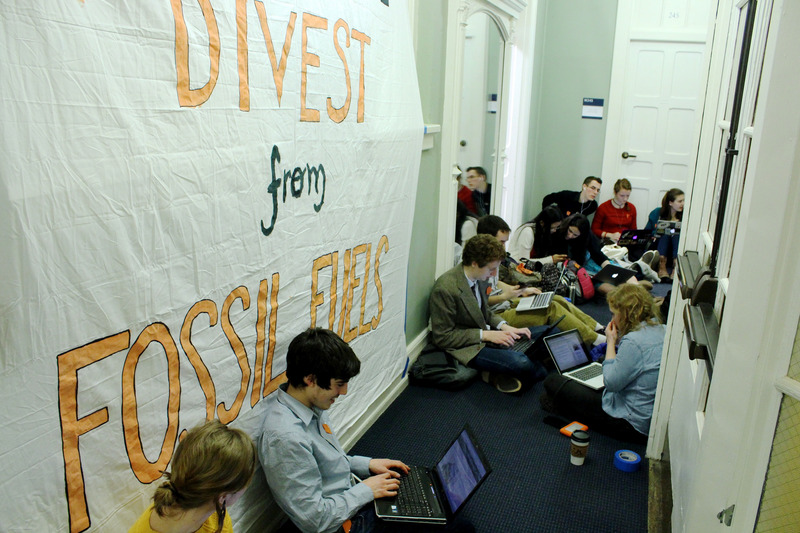 Divestment is a more meaningful way for the College to contribute to the debate on climate change. With its limited scope, the carbon charge as it currently stands does not adequately address our dependence on the fossil fuel industry either within the College community or the greater national and global community. This dependence and continued investment in the fossil fuel industry flies in the face of our values of peace, truth, respect, and justice as a former Quaker institution. How can we say we support peace if we continue to invest in an industry that fuels tension and conflict all over the world? How can we say we support truth if we continue to invest in an industry that has poured millions of dollars into concealing important information about climate change from the public and further funding climate change denial? How can we say we support respect if we continue to invest in an industry that relies on the destruction of the environment and human lives — some more so than others? How can we say we support justice if we continue to invest in an industry that unfairly targets and threatens certain communities due to their location and identity? As an institution, Swarthmore has an opportunity to uphold these values by joining the fight against the climate crisis. The Board and other members of the faculty and administration have already taken steps to do this — as can be seen through the recently approved carbon charge. The carbon charge is an important step in addressing the climate crisis and promoting our own sustainability on campus, and credit for its adoption should go to the faculty members and other individuals who spent so long working on it. At the same time, however, it is not enough. The urgency of climate change requires us to use every tool we have at our disposal — which includes divestment. Yale University’s decision to partially divest its endowment shows that divestment is financially prudent – Swarthmore should follow this example. The new carbon charge is not a replacement for divestment, as Director of Sustainability Aurora Winslade and Board of Managers Chair Tom Spock noted last month in a piece for The Daily Gazette. We agree — it is time for us to not only focus on sustainability efforts on our own campus, but also to work to deplete our dependence on an industry that profits off of inequality and destruction. The climate crisis is not going away anytime soon. What are we waiting for? ← Thoughts on Identity: Who is Hapa? Harvard University’s decision to not divest its endowment shows that non-divestment is financially prudent – Swarthmore should follow this example.